Majeskeys est situé dans un immeuble ancien au coeur du Vieux-Port de Montréal, à moins de cinq minutes à pied du PALAIS DES CONGRES. À quelques pas de Notre Dame de Basillica et Place Youville. Vous serez emmené par le luxueux, vintage, et récemment rénové appartement 1 chambre calme. Il a de hauts plafonds, fenêtres récemment rénovées, un mur de briques et une cuisine à aire ouverte qui est idéale pour accueillir des dîners. Majeskeys 1 Bdr apt comprend une salle de bain avec un jacuzzi et une douche en verre. Y compris l'écran plat t. v avec Roku Cuisine comprend: Cafetière Grille-pain, Bouilloire Micro-ondes Ustensiles de cuisine, ustensiles, vaisselle Autres avantages: Draps et serviettes fraîchement lavés, serviettes en papier et papier toilette fourni ainsi. Cette zone est un paradis pour les randonneurs. Majeskeys est situé à 4-5 minutes à pied du métro de Place-D'armes. Une station de taxis se trouve juste à côté et Uber est toujours en train d'errer dans la région. C'est à 10 minutes à pied du centre-ville. Chinatown est à 5 minutes à pied. Le front de mer est un saut et un saut loin. Just a a beautiful, well appointed, comfortable but stylish apartment in the midst of Old Montreal. The amenities were great, it was quiet, and beautifully located. Worked for the two of us, but could also accommodate several more people. There were fabulous restaurants within a block or two but, if we had been there for a week, we would have enjoyed some cooking and hanging out at the apartment. Can’t recommend this spot highly enough! The ambiance of the apartment was perfect for the heart of Old Montreal! The bed was so comfy & we woke up every morning completely refreshed. Because of the perfect location of The Majesky’s apartment, we walked everywhere. For our adventures that were further away, we were easily able to access the Metro with was close. We were also very close to Tourist Information which we visited our first day. Amazing vacation here! Very large and well appointed for the price. The Price was fantastic for this unit. Positives This unit was about 1000 sq ft. and could easily accommodate 4 people. The kitchen had everything you might need to cook your own food. There were many things of interest around us. It was a little walk (1.5miles) to the underground city but the weather was perfect. This unit was in the heart of Old Town. Uber is the best way to get around if you don't want to walk. Small Negatives The restroom is off the 1 bedroom so you must know you roommates well. There are about 21 steps to go up to get to your unit. Our Home Away From Home... but even better! 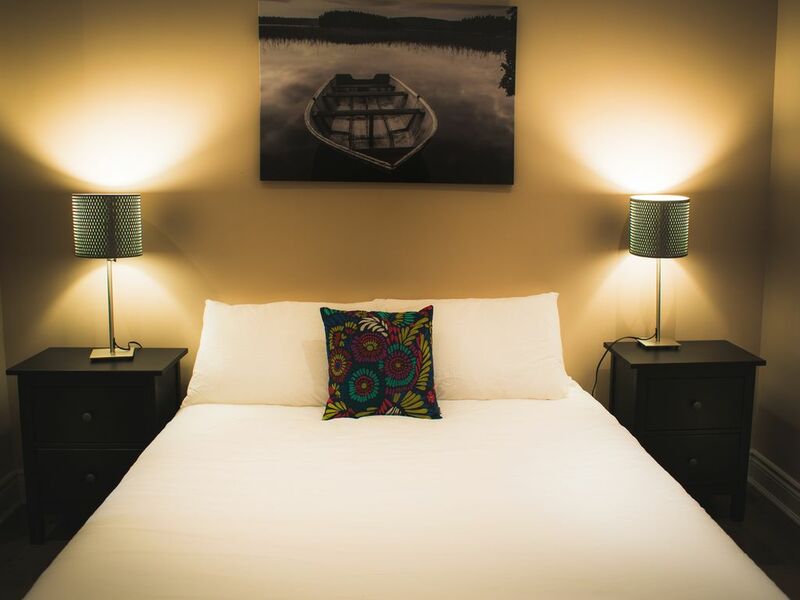 My partner and I were super excited about our visit to Montreal and were happy to be staying at Majeskeys for the duration of our trip as the rental unit far exceeded our expectations. The property manager, Misha, was a gracious host that worked hard to ensure our stay was enjoyable. She provided us with information for our stay and gave us tons of useful recommendations of places to see during our trip. The unit was immaculate....beautiful furnishings, a big screen smart TV with many apps like Netflix and Youtube, high-end stainless steel kitchen appliances, central air conditioning, a large, comfortable bed, ensuite laundry, and a jacuzzi hot tub.... all features which made our stay comfortable, convenient and enjoyable. The unit was conveniently located in the centre of Old Montreal which was very close to the harbourfront (St. Lawrence River) and central to pretty much everything. Our only real disappointment was that we didn't have more time to spend in our rental unit. Having access to a full kitchen with all the regular conveniences (microwave, blender, dishes, utensils etc) made it easy for us to keep food costs down and eat as much as we wanted to in between all the daily excursions to museums, galleries, shops, and other tourist attractions. We went to a grocery store nearby in the neighborhood and purchased everything we needed to keep us pleasantly full for the week, for much less than what it would cost us if we were eating out all the time. Of course, we were in Montreal and wanted to experience some of the great dining options of which there were plenty to choose from within the vicinity of the condo rental. During our visit to Montreal, there was a heatwave with temperatures as high as 40 degrees Celsius and so we were so thankful to have access to indoor air conditioning throughout the unit. On the hottest day there, we stayed in the unit for most of the day but didn't mind at all since our unit felt like a "home away from home". Although we did experience a couple of minor issues during our stay, Misha responded quickly and was very accommodating and pleasant to deal with. Although we were sad to leave, checkout was quick, simple and convenient. We weren't leaving town until later in the day, but Misha allowed us to store our luggage and bags in the unit until we were ready to depart. Majeskeys was certainly a 5-star experience, one we won't soon forget and simply can't wait to return for another vacation to Montreal!